The Moroccan government is now using all possible arguments to pull individual Euro-parliamentarians in their direction. At stake: the extension of a new EU-Morocco trade agreement to the territory it holds under occupation. Things are heating up in the European Parliament these days. Proposals by Members of the European Parliament (MEP) to amend a new trade agreement proposal are being labelled as "hostile" by the Government of Morocco, who suggests that this would influence the EU-Moroccan relation in the "fight against terrorism, migratory flows and security issues". The threatening language appears in letters sent by Moroccan Ambassadors to Euro-parliamentarians. See here a letter sent by Ambassador Lotfi Bouchaara to Austrian MEP Thomas Waitz, dated 29 October 2018. The letters accuse Members of the Parliament's Committees for Agriculture; Foreign Affairs; and Fisheries of having "elaborated some draft opinions and wanted to incorporate hostile amendments of a political and technical nature". Morocco's representatives list 36 amendments which they deem "obviously unjustified and neither helpful nor constructive" or outside of the committees' field of competence. The Moroccan response has infuriated Green/EFA MEP from Austria Thomas Waitz. Today, he called on the President of the European Parliament Antonio Tajani (S&D) to take "all the appropriate measures" on what he views as "a serious incident of undue pressure by a diplomatic mission". "I consider that this letter constitutes a serious assault against the independence of my mandate as enshrined in Rule 2 of the Rules of Procedure of the European Parliament. I also consider that such an extraordinary behaviour violates the EU code of conduct, notably the obligation 'not to obtain or try to obtain decisions dishonestly or by use of undue pressure or inappropriate behaviour'", Waitz wrote. The European Parliament is in the process of evaluating the proposed extension of the EU-Morocco trade deal into occupied Western Sahara. 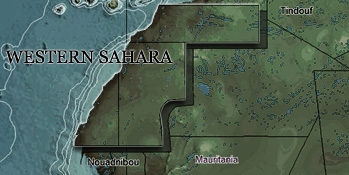 In different Parliamentary Committees, MEPsof all political groups have raised though questions, in particular on the legality underpinning the proposed extension - which itself comes on the back of a 2016 judgment by the European Court of Justice that ruled that no EU-Morocco agreement can be extended to Western Sahara, unless with the explicit consent of the people of the territory. Knowing fully well that topics as counter-terrorism and anti-migration dominate the Union's political agenda, Morocco does not hold back in underscoring that is has a "strategic" role to play in these files. "The partnership between Morocco and the European Union is rich and multidimensional. Definitely, it is not only economic but strategic in the context of the fight against terrorism, migratory flows and security issues." WSRW wrote two weeks ago that Moroccan diplomats are also circulating a document that the EU needs to adopt such an agreement in order to show recognition of the Moroccan claims to the territory it occupies. The European Parliament is expected to vote on the proposal to include Western Sahara in the EU-Morocco trade deal in plenary in January 2019. The preparatory work in the committees - which Morocco seeks to influence by exerting unwarranted pressure on individual MEPs - will be terminated in December this year.